25143 Itokawa (/ˌiːtoʊˈkɑːwə/; Japanese: イトカワ,いとかわ,糸川 [itokaɰa]; provisional designation 1998 SF36) is a sub-kilometer near-Earth object of the Apollo group and a potentially hazardous asteroid. It was discovered by the LINEAR program in 1998 and later named after Japanese rocket engineer Hideo Itokawa. The strange peanut-shaped S-type asteroid has a rotation period of 12.1 hours and measures approximately 330 meters (1,100 feet) in diameter. Due to its low density and high porosity, Itokawa is considered to be a rubble pile, consisting of numerous boulders of different sizes rather than of a single solid body. It was the first asteroid to be the target of a sample return mission, the Japanese Hayabusa space probe, which collected more than 1500 regolith dust particles from the asteroid's surface in 2005. After its return to Earth in 2010, the mineralogy, petrography, chemistry, and isotope ratios of these particles have been studied in detail, providing insights into the evolution of the Solar System. Itokawa is the smallest asteroid ever photographed and visited by a spacecraft. Itokawa was discovered on 26 September 1998 by astronomers with the Lincoln Near-Earth Asteroid Research (LINEAR) program at Lincoln Laboratory's Experimental Test Site near Socorro, New Mexico, in the United States. It was given the provisional designation 1998 SF36. The body's observation arc begins with its first observation by the Sloan Digital Sky Survey just one week prior to its official discovery observation. The minor planet was named in memory of Japanese rocket scientist Hideo Itokawa (1912–1999), who is regarded as the father of Japanese rocketry. The official naming citation was published by the Minor Planet Center on 6 August 2003 (M.P.C. 49281). Itokawa belongs to the Apollo asteroids. They are Earth-crossing asteroids and the largest dynamical group of near-Earth objects with nearly 10 thousand known members. Itokawa orbits the Sun at a distance of 0.95–1.70 AU once every 18 months (557 days; semi-major axis of 1.32 AU). Its orbit has an eccentricity of 0.28 and an inclination of 2° with respect to the ecliptic. It has a low Earth minimum orbital intersection distance of 0.0131 AU (1,960,000 km), which corresponds to 5.1 lunar distances. Left: orbital diagram of Itokawa on December 2006. Right: animated orbits of Itokawa (green) and Earth (blue) around the Sun. This artist's impression, based on detailed spacecraft observations, shows the strange peanut-shaped asteroid Itokawa. In 2000, it was selected as the target of Japan's Hayabusa mission. The probe arrived in the vicinity of Itokawa on 12 September 2005 and initially "parked" in an asteroid–Sun line at 20 km (12 mi), and later 7 km (4.3 mi), from the asteroid (Itokawa's gravity was too weak to provide an orbit, so the spacecraft adjusted its orbit around the Sun until it matched the asteroid's). Hayabusa landed on 20 November for thirty minutes, but it failed to operate a device designed to collect soil samples. On 25 November, a second landing and sampling sequence was attempted. The sample capsule was returned to Earth and landed at Woomera, South Australia on 13 June 2010, around 13:51 UTC (23:21 local). On 16 November 2010, the Japan Aerospace Exploration Agency reported that dust collected during Hayabusa's voyage was indeed from the asteroid. Names of major surface features were proposed by Hayabusa scientists and accepted by the Working Group for Planetary System Nomenclature of the International Astronomical Union. 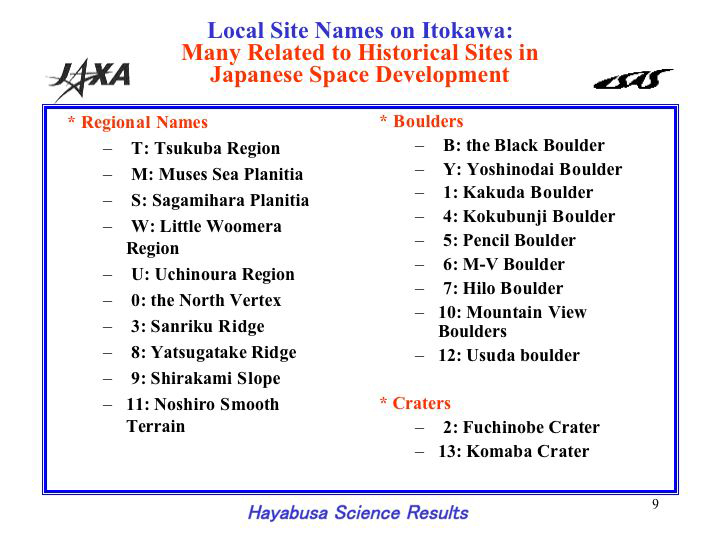 Also, the Hayabusa science team is using working names for smaller surface features. The following tables list the names of geological features on the asteroid. No naming conventions have been disclosed for surface features on Itokawa. Ten impact craters on the surface of Itokawa were named on 18 February 2009. Regio or regiones are large area marked by reflectivity or color distinctions from adjacent areas in planetary geology. The following regiones have been named on Itokawa. Schematic of Itokawa's two lobes separated from each other. Their divergent densities suggest that these were stand-alone bodies that came into contact later on, making the rubble pile also a likely contact binary. Itokawa is a stony S-type asteroid. Radar imaging by Goldstone in 2001 observed an ellipsoid 7002630000000000000♠630±60 meters long and 7002250000000000000♠250±30 meters wide. The Hayabusa mission confirmed these findings and also suggested that Itokawa may be a contact binary formed by two or more smaller asteroids that have gravitated toward each other and stuck together. The Hayabusa images show a surprising lack of impact craters and a very rough surface studded with boulders, described by the mission team as a rubble pile. Furthermore, the density of the asteroid is too low for it to be made from solid rock. This would mean that Itokawa is not a monolith but rather a rubble pile formed from fragments that have cohered over time. Based on Yarkovsky–O'Keefe–Radzievskii–Paddack effect measurements, a small section of Itokawa is estimated to have a density of 7003290000000000000♠2.9 g/cm3, whereas a larger section is estimated to have a density of 1.8 g/cm³. Since 2001, a large number of rotational lightcurves of Itokawa have been obtained from photometric observations. Analysis of the best-rated lightcurve by Mikko Kaasalainen gave a sidereal rotation period of 7001121320000000000♠12.132 hours with a high brightness variation of 0.8 magnitude, indicative of the asteroid's non-spherical shape (U=3). In addition, Kaasalainen also determined two spin axes of (355.0°, −84.0°) and (39°, −87.0°) in ecliptic coordinates (λ, β). Alternative lightcurve measurements were made by Lambert (7001120000000000000♠12 h), Lowry (7001121000000000000♠12.1 and 7001121199999999999♠12.12 h), Ohba (7001121500000000000♠12.15 h), Warner (7001120900000000000♠12.09 h),[a] Ďurech (7001121323000000000♠12.1323 h), and Nishihara (7001121324000000000♠12.1324 h). The 26 August 2011 issue of Science devoted six articles to findings based on dust that Hayabusa had collected from Itokawa. 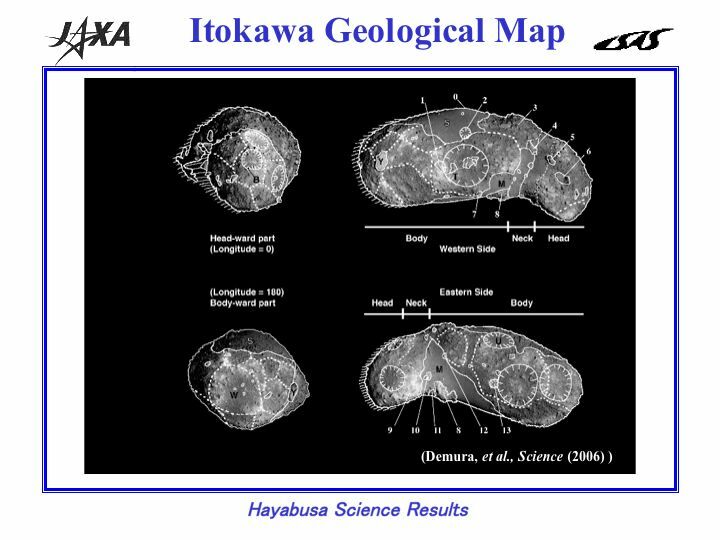 Scientists' analysis suggested that Itokawa was probably made up from interior fragments of a larger asteroid that broke apart. Dust collected from the asteroid surface is thought to have been exposed there for about eight million years. Scientists used varied techniques of chemistry and mineralogy to analyze the dust from Itokawa. Itokawa's composition was found to match the common type of meteorites known as "low-total-iron, low metal ordinary chondrites". Another team of scientists determined that the dark iron color on the surface of Itokawa was the result of abrasion by micrometeoroids and high-speed particles from the Sun which had converted the normally whitish iron oxide coloring. 2O" apparently formed by implantation of solar wind hydrogen. The rims of an olivine particle "show an enrichment of up to ~1.2 at % in OH and H20". The water concentrations of the Itokawa grains would indicate an estimated BSI (Bulk Silicate Itokawa) water content in line with Earth's bulk water, and that Itokawa had been a "water-rich asteroid". ^ Lightcurve plot of (25143) Itokawa, Palmer Divide Observatory (716) by B. D. Warner (2004). Summary figures at the LCDB. ^ a b c d e f "25143 Itokawa (1998 SF36)". Minor Planet Center. Retrieved 25 February 2019. ^ Schmadel, Lutz D. (2006). "(25143) Itokawa [1.32, 0.28, 1.6]". Dictionary of Minor Planet Names – (25143) Itokawa, Addendum to Fifth Edition: 2003–2005. Springer Berlin Heidelberg. p. 188. doi:10.1007/978-3-540-34361-5_2203. ISBN 978-3-540-34361-5. ^ a b c d e f g "JPL Small-Body Database Browser: 25143 Itokawa (1998 SF36)" (2019-02-04 last obs.). Jet Propulsion Laboratory. Retrieved 25 February 2019. ^ a b c d e Fujiwara, A.; Kawaguchi, J.; Yeomans, D. K.; Abe, M.; Mukai, T.; Okada, T.; et al. (June 2006). 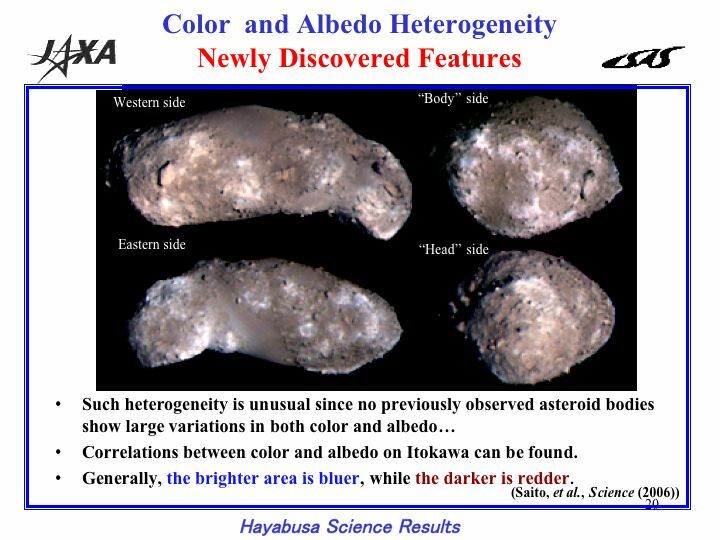 "The Rubble-Pile Asteroid Itokawa as Observed by Hayabusa". Science. 312 (5778): 1330–1334. Bibcode:2006Sci...312.1330F. doi:10.1126/science.1125841. Retrieved 25 February 2019. ^ a b c Mueller, Michael; Delbo', M.; Hora, J. L.; Trilling, D. E.; Bhattacharya, B.; Bottke, W. F.; et al. (April 2011). "ExploreNEOs. III. Physical Characterization of 65 Potential Spacecraft Target Asteroids". The Astronomical Journal. 141 (4): 9. Bibcode:2011AJ....141..109M. doi:10.1088/0004-6256/141/4/109. ^ a b c d e "LCDB Data for (25143) Itokawa". Asteroid Lightcurve Database (LCDB). Retrieved 15 August 2017. ^ a b c Sekiguchi, T.; Abe, M.; Boehnhardt, H.; Dermawan, B.; Hainaut, O. R.; Hasegawa, S. (January 2003). "Thermal observations of MUSES-C mission target (25143) 1998 SF36". Astronomy and Astrophysics. 397: 325–328. Bibcode:2003A&A...397..325S. doi:10.1051/0004-6361:20021437. Retrieved 15 August 2017. ^ a b Abe, Shinsuke; Mukai, Tadashi; Hirata, Naru; Barnouin-Jha, Olivier S.; Cheng, Andrew F.; Demura, Hirohide; et al. (June 2006). "Mass and Local Topography Measurements of Itokawa by Hayabusa". Science. 312 (5778): 1344–1349. Bibcode:2006Sci...312.1344A. doi:10.1126/science.1126272. Retrieved 25 February 2019. ^ a b Kaasalainen, M.; Kwiatkowski, T.; Abe, M.; Piironen, J.; Nakamura, T.; Ohba, Y.; et al. (July 2003). "CCD photometry and model of MUSES-C target (25143) 1998 SF36". Astronomy and Astrophysics. 405 (3): L29–L32. Bibcode:2003A&A...405L..29K. doi:10.1051/0004-6361:20030819. Retrieved 15 August 2017. ^ Thomas, C. A.; Trilling, D. E.; Emery, J. P.; Mueller, M.; Hora, J. L.; Benner, L. A. M.; et al. (September 2011). "ExploreNEOs. V. Average Albedo by Taxonomic Complex in the Near-Earth Asteroid Population". The Astronomical Journal. 142 (3): 12. Bibcode:2011AJ....142...85T. doi:10.1088/0004-6256/142/3/85. Retrieved 15 August 2017. ^ Thomas, Cristina A.; Emery, Joshua P.; Trilling, David E.; Delbó, Marco; Hora, Joseph L.; Mueller, Michael (January 2014). "Physical characterization of Warm Spitzer-observed near-Earth objects". Icarus. 228: 217–246. arXiv:1310.2000. Bibcode:2014Icar..228..217T. doi:10.1016/j.icarus.2013.10.004. Retrieved 15 August 2017. ^ a b Carry, B.; Solano, E.; Eggl, S.; DeMeo, F. E. (April 2016). "Spectral properties of near-Earth and Mars-crossing asteroids using Sloan photometry". Icarus. 268: 340–354. arXiv:1601.02087. Bibcode:2016Icar..268..340C. doi:10.1016/j.icarus.2015.12.047. Retrieved 15 August 2017. ^ Dermawan, Budi; Nakamura, Tsuko; Fukushima, Hideo; Sato, Hideo; Yoshida, Fumi; Sato, Yusuke (August 2002). "CCD Photometry of the MUSES-C Mission Target: Asteroid (25143) 1998 SF36". Publications of the Astronomical Society of Japan. 54 (4): 635–640. Bibcode:2002PASJ...54..635D. doi:10.1093/pasj/54.4.635. Retrieved 15 August 2017. ^ a b Nishihara, S.; Abe, M.; Hasegawa, S.; Ishiguro, M.; Kitazato, K.; Miura, N.; et al. (March 2005). "Ground-based Lightcurve Observation of (25143) Itokawa, 2001–2004". 36th Annual Lunar and Planetary Science Conference. 36: 1833. Bibcode:2005LPI....36.1833N. Retrieved 15 August 2017. ^ a b c d "Official Approval of Names on ITOKAWA by IAU". Press Release of JAXA. 3 March 2009. Retrieved 25 February 2019. ^ "MPC/MPO/MPS Archive". Minor Planet Center. Retrieved 15 August 2017. ^ Atkinson, Nancy (16 November 2010). "Confirmed: Hayabusa Nabbed Asteroid Particles". Universe Today. Archived from the original on 6 December 2010. Retrieved 16 November 2010. ^ a b "Planetary Names: Itokawa". Gazetteer of Planetary Nomenclature – USGS Astrogeology Research Program. Retrieved 25 February 2019. ^ "The Anatomy of an Asteroid". ESO Press Release. Retrieved 6 February 2014. ^ Ostro, S. J.; Benner, L. A. M.; Nolan, M. C.; Giorgini, J. D.; Jurgens, R. F.; Rose, R.; et al. (November 2001). "Radar Observations of Asteroid 25143 (1998 SF36)" (PDF). American Astronomical Society. 33: 1117. Bibcode:2001DPS....33.4113O. Retrieved 25 February 2019. ^ "The Anatomy of an Asteroid". ESO. 5 February 2014. Retrieved 5 February 2014. ^ Lambert, J. S.; Tholen, D. J. (December 2001). "Rotational Studies of MUSES-C Target Asteroid (25143) 1998 SF36". American Astronomical Society. 33: 1402. Bibcode:2001AAS...199.6303L. Retrieved 15 August 2017. ^ Lowry, S. C.; Weissman, P. R.; Hicks, M. D. (November 2001). "CCD Observations of Asteroid 1998 SF36 (25143)". American Astronomical Society. 33: 1150. Bibcode:2001DPS....33.5909L. Retrieved 15 August 2017. ^ Lowry, Stephen C.; Weissman, Paul R.; Hicks, Michael D.; Whiteley, Robert J.; Larson, Steve (August 2005). "Physical properties of Asteroid (25143) Itokawa—Target of the Hayabusa sample return mission". Icarus. 176 (2): 408–417. Bibcode:2005Icar..176..408L. doi:10.1016/j.icarus.2005.02.002. Retrieved 15 August 2017. ^ Ohba, Y.; Abe, M.; Hasegawa, S.; Ishiguro, M.; Kwiatkowski, T.; Colas, F.; et al. (June 2003). "Pole orientation and triaxial ellipsoid shape of (25143) 1998 SF36, a target asteroid of the MUSES-C* mission". Earth. 55: 341–347.(EP&SHomepage). Bibcode:2003EP&S...55..341O. Retrieved 15 August 2017. ^ Warner, Brian D. (September 2004). "Lightcurve analysis for numbered asteroids 301, 380, 2867, 8373, 25143, and 31368". The Minor Planet Bulletin. 31 (3): 67–70. Bibcode:2004MPBu...31...67W. ISSN 1052-8091. Retrieved 15 August 2017. ^ Durech, J.; Vokrouhlický, D.; Kaasalainen, M.; Weissman, P.; Lowry, S. C.; Beshore, E.; et al. (September 2008). "New photometric observations of asteroids (1862) Apollo and (25143) Itokawa – an analysis of YORP effect". Astronomy and Astrophysics. 488 (1): 345–350. Bibcode:2008A&A...488..345D. doi:10.1051/0004-6361:200809663. Retrieved 15 August 2017. ^ a b "Asteroid Dust Confirms Meteorite Origins". New York Times. 25 August 2011. Retrieved 26 August 2011. ^ a b Nakamura, Tomoki; Noguchi, Takaaki; Tanaka, Masahiko; Zolensky, Michael E.; Kimura, Makoto; Tsuchiyama, Akira; et al. (August 2011). "Itokawa Dust Particles: A Direct Link Between S-Type Asteroids and Ordinary Chondrites". Science. 333 (6046): 1113–6. Bibcode:2011Sci...333.1113N. doi:10.1126/science.1207758. PMID 21868667. Retrieved 25 February 2019. ^ a b "Most Earth meteorites linked to single asteroid". Los Angeles Times. 26 August 2011. Retrieved 26 August 2011. ^ Jin, Z. L.; Bose, M.; Peeters, Z. (March 2018). "New Clues to Ancient Water on Itokawa" (PDF). 49th Lunar and Planetary Science Conference. Bibcode:2018LPI....49.1670J. Retrieved 25 February 2019. ^ Daly, L; Lee, M; Hallis, L; Bland, P; Reddy, S; et al. (2018). "The origin of hydrogen in space weathered rims of Itokawa regolith particles" (PDF). 2018 Hayabusa Symposium (PDF). ^ Jin Z; Bose M (2018). "Establishing Itokawa's water contribution to Earth" (PDF). 2018 Hayabusa Symposium (PDF). Normile, D (30 April 2010). "Spunky Hayabusa Heads Home With Possible Payload". Science. 328 (5978): 565. Bibcode:2010Sci...328..565N. doi:10.1126/science.328.5978.565. PMID 20430991. Wikimedia Commons has media related to 25143 Itokawa.